This isn't writing-related (though I suppose it touches on written communication, and how some Customer Service departments don't seem to be able to interpret or trouble-shoot basic problems). However, I couldn't find any information about this problem online, so thought I'd put it here in case it helps other people. This problem applies to Amazon Kindle Fires directly, but is likely to appear in other devices which can play back media. I had two Kindle Fires so gave someone else the newest one (I actually prefer the older Kindle Fires - the new ones require closing down loads of open apps every time you use it, whereas the old ones closed apps automatically as soon as you opened another). She registered it in her name so that she could put her own stuff on, though our accounts are connected via Amazon's household scheme. As someone who has used Kindle Fires for a long time, I was obviously on hand to answer questions. Last night we were testing out the main things she wanted to use the Kindle for. One of them was listening to music or podcasts. We have external powered speakers in some rooms, so we can plug in an mp3 player, phone or media device to play music with better quality sound than the tinny internal speakers most devices have. This has been fine for many years, and worked without problems. However, this Kindle Fire was behaving strangely - when I plugged it into external speakers the volume dropped to 50%, and there was no way to increase it. I looked in the settings but whatever I set there still got halved when I plugged the speakers in. So the result was that plugging in high-quality external powered speakers actually made the volume lower, when it should be the opposite. The speakers were Logitech S-220. I tried another set of speakers with the same result: Sony SRS A202. So two totally different brands – plugging them in suddenly stopped the volume going past around halfway (or a bit under). I tried my Sennheiser MX365 earphones – the Kindle again limited the volume. Same with some Apple iPad earbuds. I should add that both speaker sets and both headphone sets work perfectly on every other device (two laptops, a different Kindle, a smartphone, an iPad, a HDD jukebox music player etc). I suspected this was a bug in Kindle software, rather than a fault in the individual device - the behaviour was too uniform. I said I'd look into it. You know, being nice and helpful. Just to clarify a few things. There are no security issues with finding out how to use a Kindle in general. We shouldn't have to go to support to find out how it works and how to get round Kindle problems; but if we do then we should be given clear answers, not be fobbed off. They could forget the individual device and just imagine it is a generic question about Kindle Fire 7s. It's not difficult. Especially when it looks like it is part of how all those versions of Kindles are set up. 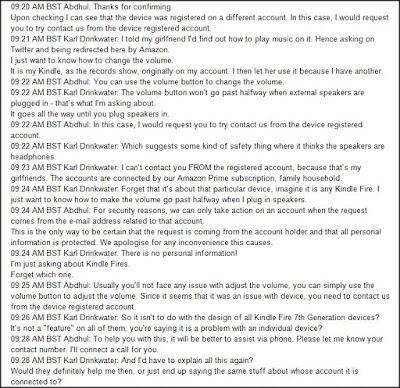 (Further - the "connected account" thing is a problem with how Amazon sees things. In reality two people own adn share the device, but Amazon refuse to accept that this is possible, and force it to only be connected to a single person. The real world, and Amazon's policies, don't match up.) Anyway, Amazon Help refused to look into it. I went back to Twitter and explained that, but a raft of different support staff ("FJ", "RB", "KI", "NV", "RS", "BZ", "TP", "ES", "CN" etc.) kept telling me to go back to Amazon chat or phone help, even though I'd get the same response. Not one of the Amazon staff suspected that Amazon may have set the devices up like this on purpose. That's my suspicion, anyway (since they won't confirm it). I think Kindle Fires have been programmed to limit the volume to 50% when things are plugged into the headphone/speaker jack. It's mentioned in obscure places on forums, where people run into the problem (such as here), yet Amazon Support don't seem to be aware of the problem. I further suspect that it is an update implemented as a knee-jerk reaction to something like this EU mandate on "new safety standards for personal music players". Though that mandate also says "the safe exposure level will be the default setting on personal music players but users will be able to override the default setting if they expressly choose to do so. The key is that they make and informed choice, fully aware of any potential health risks." Whereas I can't find any override on the Kindle Fire, so Amazon have either not put one in, or have made it unintuitive to find. I'm guessing Amazon implemented this limit, but just didn't consider the repercussion that plugging quality powered speakers in makes the device quieter than it's tinny internal speaker, when speakers shouldn't be limited. That makes it a buggy implementation of a safety feature. At the first contact with Amazon they should have spotted what it was about, and been able to start a discussion of it - why the Kindle was behaving like that, how to over-ride it, or how to report it as a bug if they didn't implement an over-ride. The fundamental issue should be "Is this expected behaviour?" If they didn't design it that way, then the device is faulty. If they designed it that way, then they made an error in how it is implemented, and it needs to be fixed via software update. Simple. 1. Amazon seem to have implemented a "safety feature" that limits the volume of Kindle Fires when output is sent to the 3.5mm output jack. Amazon presumably meant to apply it only to headphones, so there should be an over-ride for when using it with speakers. Except there is no obvious over-ride for speakers, so connecting quality powered speakers actually makes the Kindle quieter. It's an example of not thinking through the implications of knee-jerk updates. 2. I dealt with a large number of Amazon Customer Services people and not one of them knew anything about it, they just sent me in circles for a whole morning, telling me to use contact methods that I'd already used and where staff had refused to help - going through the same process again would lead to the same outcome. What should have been simple has instead wasted half a day and is still not resolved or acknowledged. This isn't new. I've had problems with Amazon's terrible communication in the past - see this post and the ones it links to at the start if you want to know more. 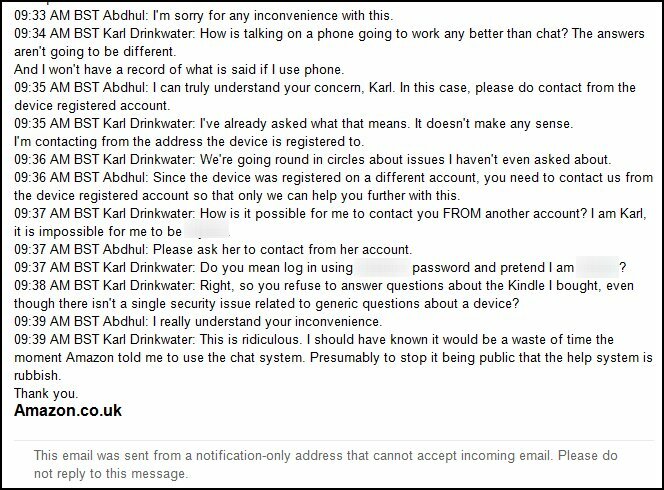 After all the communications with Amazon a few days ago I was told they would sort it out. 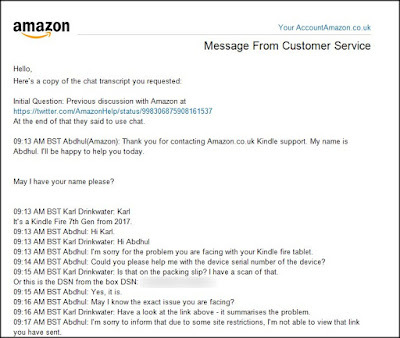 On 21st May one email said the "Kindle technical specialists" would ring me "within the next 4 hours". 48 hours later I've still not received a call, a reply, or any answers. I am sorry for any inconvenience caused in this regard. I have checked our records and I can confirm that mentioned Kindle Fire is not registered under your account. For security reasons, we can take action or send order information to the e-mail address that is associated with the Kindle registered Amazon.co.uk account. We're sorry for any inconvenience this causes. Even though this had been explained and got past many times ... the next Amazon person would fall back on this again. Argh. 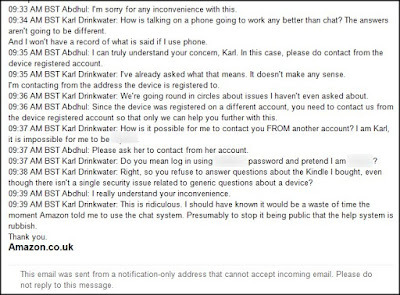 Amazon are incredibly inflexible and unhelpful with their customers, the opposite of being "customer-centric". Support consists mostly of copy and pasting the same messages and repeating things that are either irrelevant, or were resolved further back in the communication chain. And then another staff member takes over and it starts again. 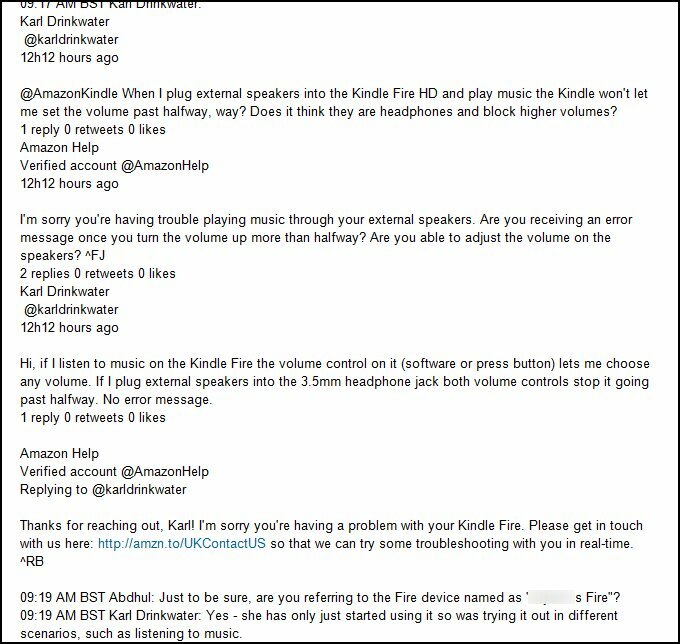 Some Amazon staff seem to think the new Kindle Fires don't work with speakers connected via 3.5mm jack (well, not beyond 50% volume); others say they do; others have no idea. Half the time I'd not even get a response to my message. It's bizarre that Amazon doesn't seem to know how its own devices work. Someone at Amazon actually rang me on 8th June 2018. They were one of those who thought it should work with speakers at 100% volume. 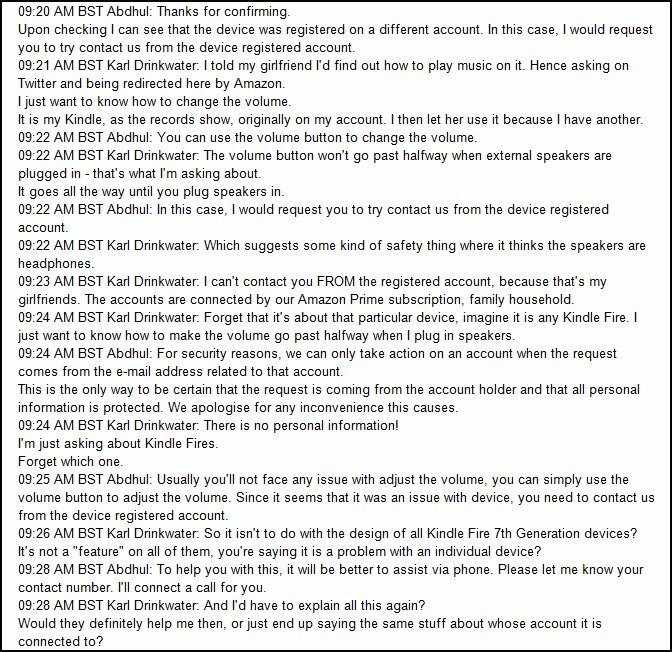 They wanted to look at logs on the device but it involved me ringing back another day, getting the person to whom it was registered to authorise Amazon to speak to me, then passing the phone over. I followed their instructions and after some confusion it seemed that I'd been given incorrect information and they didn't need logs but wanted to factory reset it (which loses a lot of content and requires setting everything up again - email, 3rd party apps etc). 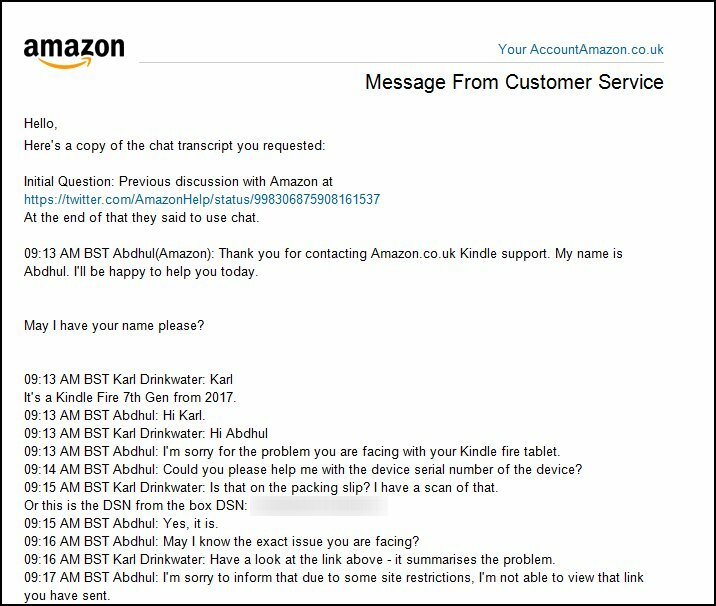 I gave them the case ID #0150893141 but it seems that most of the emails and communications weren't part of the details - Amazon staff hadn't been making a note of my answers to their questions. They hadn't even recorded the URL for this blog post with all the background information and video in; and when I asked them to add it, they said they didn't know if they could, so they didn't ask for the URL to record. It's why it is so frustrating to speak to a different Amazon person each time, none of which know the background so you are always starting back at square one. They suggested replacing the Kindle but since that involves setting everything up again I didn't want to do it unless it would fix the problem - if it is how the new Kindles are designed, as some Amazon staff claim, then replacing it wouldn't fix the problem: it would just be a further waste of time and resources. After some communication problems the phone eventually went dead. I waited a couple of hours for them to ring me back but they never did. Here's another strange thing. You'd always assume new devices had more and better connectivity. It turns out that my 2012 2nd Generation Kindle Fire HD has better connections than all Amazon's Kindle Fire models since 2012. My old Kindle Fire HD has mini-HDMi so I can plug it into an external display like my monitor or projector, and it outputs the sounds and video so I can watch films, look at pictures, or even just browse the web and email on a big screen. 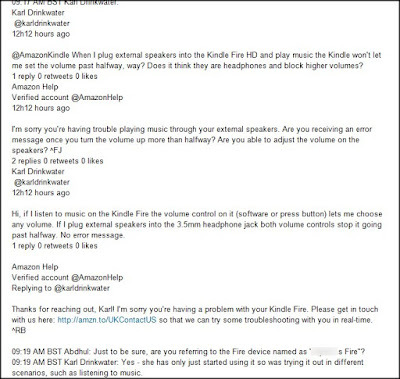 After 2012 Amazon stopped including any way to connect Kindles to an external device such as my projector. For the new ones you can only use the Kindle's teeny screen. That makes them far less useful and attractive. I have no idea why the designers keep removing useful (and cheap to implement) features. I would never buy any of Amazon's modern Kindle Fires, HD or not, because they don't do as much as the old 2012 models. Strangely, when I read reviews of many modern tablets - Amazon, Android etc - even in the specs section reviewers don't bother mentioning what wired outputs the devices have any more, only the wireless ones. It's not easy to find the information even on manufacturers' sites. Part of me thinks I shouldn't have said anything!